What a weather change we are enjoying. We had a great weekend sharing all the news and goodies from our recent trip to Houston and the Fall Quilt Market. The packages continue to arrive daily so stop by and check our "What's NEW!" It is located in our Classroom Annex which we are happy to show you if a class is not in session. There are some neat new things. Projects from the new Nancy Halvorsen Book "Count On It"
We are expecting a shipment of "Sand in my Shoes" this week. Yes, that is the missing fabrics for the remaining BEACH WALK quilt. We will get the outstanding orders ready and will cut several full quilt kits. It is not too late to purchase the entire quilt kit. Many have chosen to wait until after the holiday season to start but we guarantee there will be no fabric available then. 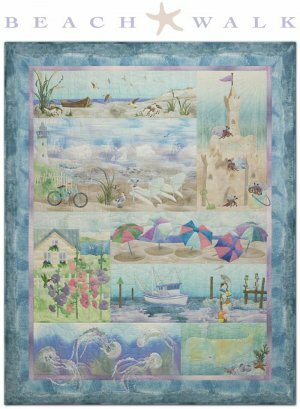 This quilt is Perfect for the sunny Florida seashore. It is on display behind the cash register in the Shop. This is a great opportunity to have a magnificent quilt which doubles as a painting. Excuse our mess as we re-arrange the shelves. We are giving the JaM Patch a new improved look. Afterall our Fifth Birthday is coming up. But in the mean time--- watch your step and keep your eyes open. After all is moved around and you may find untold treasures. We are finding some of our own treasures. To help the move we are offering a "Thankful Sell- a- bration". 20% off your entire purchase this week through Saturday, November 13th, excluding any BOM such as Beach Walk, Thimbleberries, Charmed Life, Bread and Butter Society and Christmas Baltimore. We are open 10 - 4 daily. It is our way of saying "thank you" for all your patronage. We are so thankful for your business and friendship. We are here to help so stop by and take advantage of the sale. Our NEW goodies in the classroom annex are excuded from the sale as well. Please remember no Clubhouse points will be awarded or Clubhouse Gift Certificates redeemable. All sales are final. Both Wednesday and Saturday mornings, 9 - 12, we are gathering for the third session of the Bread and Butter Society. This week we are working on Fruit Chutney. A great scrappy pattern with 9-patch blocks and flying geese. Saturday afternoon, 12:30 - 4, we are meeting for another Beach Walk session. The class is free if you purchased your kits at The JaM Patch or just $10 for others. You can work on any of the patterns you chose. We are here to help!